We show you just how large the R2E2 mango tree is and we talk about the seedling and grafted mango tree selections. The r2e2 is actually very hardy once established and is a great choice for cold marginal climates in Australia. This is for the seedling r2e2 and not the grafted r2e2. If you are in a subtropical to tropical climate best to get a grafted variety if your climate is cold and marginal than best to get a seedling. You will still need to protect it until it is at least 3m tall. Now these great big Mangoes are the R2E2 mango and they are one of the largest of the Mango Fruits. They have this beautiful coloured fruit it's got a good flavour. We grow these as a grafted plant and we also grow them as seedlings. So if you have a seed grown mango tree some of them will be grown true to type but some of them aren't going to be grown true to type so you are going to get some seedling variations as we say. But they are a really fabulous tree it's quite a large tree give it plenty of space. It's going to grow more than 6m so be prepared to have a big tree in your backyard. But they are a lovely shady evergreen tree as well so a great tree to have in your backyard if you have the space. That's a beautiful tree beautiful fruit. 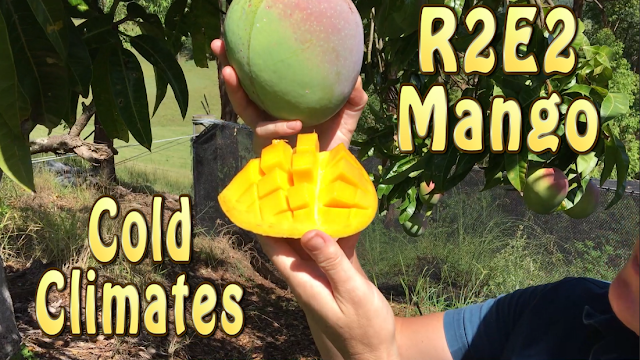 The R2E2's are one of the best varieties to grow if you are in a marginal climate so if you live in South Australia or Victoria or south of Sydney and you want to try growing a Mango the R2E2 is one of the best choices to try. It's a bit hardier than the others. So although we can't promise you success if you're in a frost free location and you can protect your tree for the first few years until it's about 3m tall or so you are going to have a good chance of getting Mango fruits. So you might find that you have good Seasons and bad Seasons and that's pretty much Weather dependant. So you haven't got a great deal of control on that it's just something you have to take with growing Mangoes. 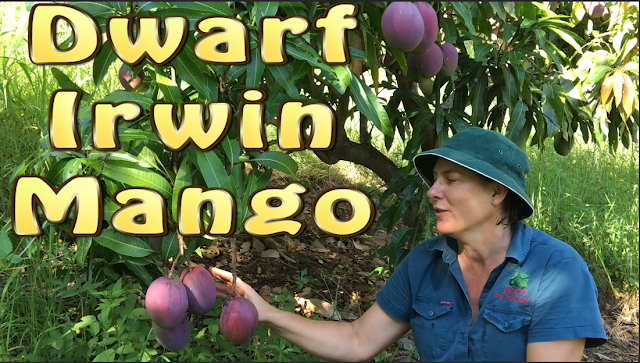 But worth trying if you want to try growing Mangoes in a difficult Mango growing climate. So like all Mangoes best suited to the Tropics and the Subtropics. Give them a frost free location, good drainage, full Sun and you will be cropping Mangoes like this off a Seedling tree in about 6 years and off a Grafted plant in about 3. 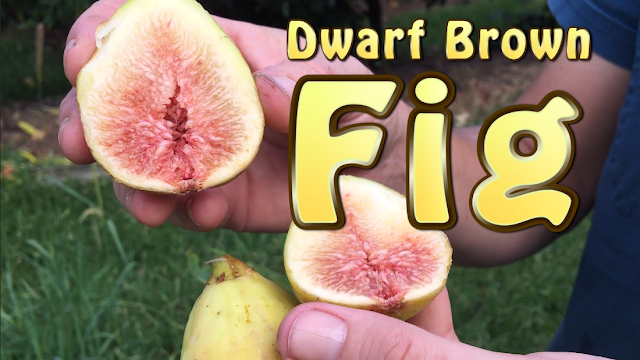 The Dwarf Brown Fig Tree is small and can stay under 1m in height yet it still produces these lovely and delicious figs that you will love. Yes they can be grown in pots or if you have a tiny space in your backyard that gets some Sun it is a plant that will not take over that position but just stay small. It's Summer here, the middle of summer and we are just picking the first of our Figs. So this Fig is our Dwarf Brown Fig and you can see it has this beautiful light pale skin. and this lovely pale flesh as well and it's a really sweet fig this so it's delicious eaten fresh off the tree a really lovely fruit. and the Dwarf Brown Fig only grows to about 2-3m. So if you are in a small urban block or only have a little space for a Fig this Dwarf Brown Fig is a great choice for you. It's also perfect for growing in pots so if you are growing it in a container use a really good quality potting mix. and keep the moisture up to it during the growing Season. So while it's in full leaf and fruiting and growing you will need to maintain even moisture in your pot. In the ground give it a Sunny position and good drainage and you will be picking these beautiful Figs in about 2 years. It's quite sweet isn't it. These are our stock plants so I just wanted to show you how we grow these. There are a lot of people who are patiently waiting for the Dwarf Brown Fig and with slow growing plants such as these we take a batch of cuttings and then we grow them on to have established stock trees. So from these potted plants and there is about 30 or 40 here we're taking cuttings and it's the cuttings from these plants which we will sell to you. So we take these at 2 times during the year we take them during the growing Season so during the Summer months while they are actively growing we take Softwood cuttings and then again in the Winter we take Hardwood cuttings and they're done as deciduous cuttings we root and then grow on in the Spring. The Yeem Pay Wampee Tree is the sweetest of the Wampee fruit trees and is popular because of this reason. We discuss the best climates, the growth habit and the way it fruits. It is a large tree but this doesn't mean it can't be grown in pots unlike the seedling varieties. 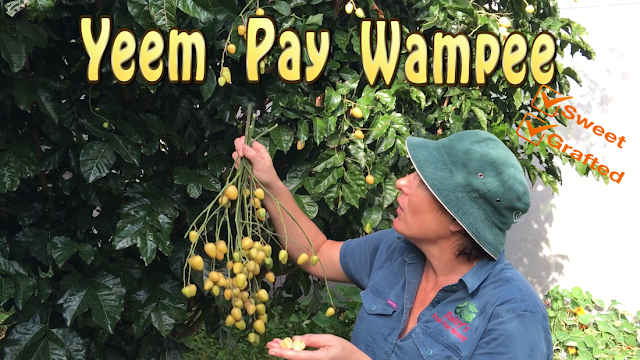 Now this beautiful fruit is the Yeem Pay Wampee and this is the sweeter of the 2 varieties of grafted Wampees we sell and it's really popular for that reason. So like all Wampees it fruits on it's terminal growth so it hangs off in these great panicles of fruit and it's really stunning in full fruit. Now these are lovely and sweet they're a little bit like a grape in terms of the texture so they have that beautiful juicy flesh inside. Great flavour and it's a really hardy tree. So Wampees are related to citrus and they'll pretty much grow in the same places that citrus do really well. 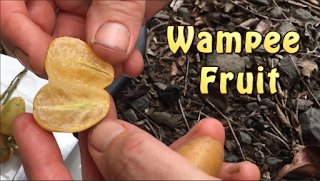 So if you've got a nice warm sunny spot even if you get a light frost you might want to try a Wampee because they are a really beautiful fruit and they give you loads of fruit as well so they are a great cropping tree, great tasting and grow in a wide range of climates. So Subtropics and Tropics they're perfectly suited to in Temperate areas down to about -2 to -3. And it grows to about 5-6 metres so it does grow to a fair sized tree and if you've got a small backyard you could prune it or even grow it in a pot. don't have any fibre and they are only a small tree so this tree is about 4m tall and it was planted in this orchard at the same time as the other mangoes which are nearly twice as big so it shows you it's less vigorous and much smaller. If you wanted to keep it to about 2m you would need to prune your tree back every few years but just keep in mind that because the mangoes come on the end of the growth you are going to cut your crop off so if you do prune your mangoes back be prepared to lose the fruit for a season. This has got a great crop on it this year and having a good crop of mangoes is all weather dependent so if you have a nice hot dry Spring you will have a great crop of mangoes. 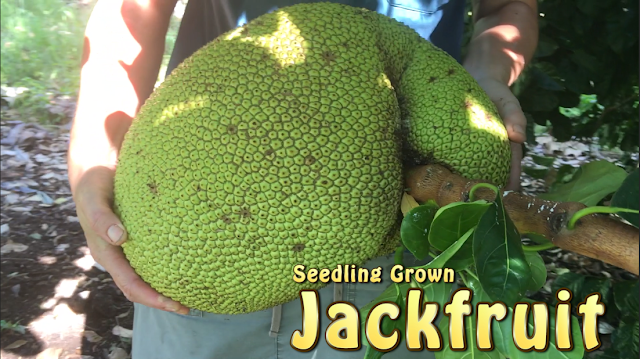 Seedling Jackfruit Trees can crop Jackfruit within 4 years even though the fruit can weigh up to 24kg. They are great wind breaks and the fruit is used in many dishes throughout the world. 100's of Fruit Tree varieties grown in a small space in Daleys Biodome. Take a look in Kyogle when you visit Daleys Nursery. We show you how much it has changed in 15 months and the methods we use to keep usually large trees small and how to get them to fruit earlier. 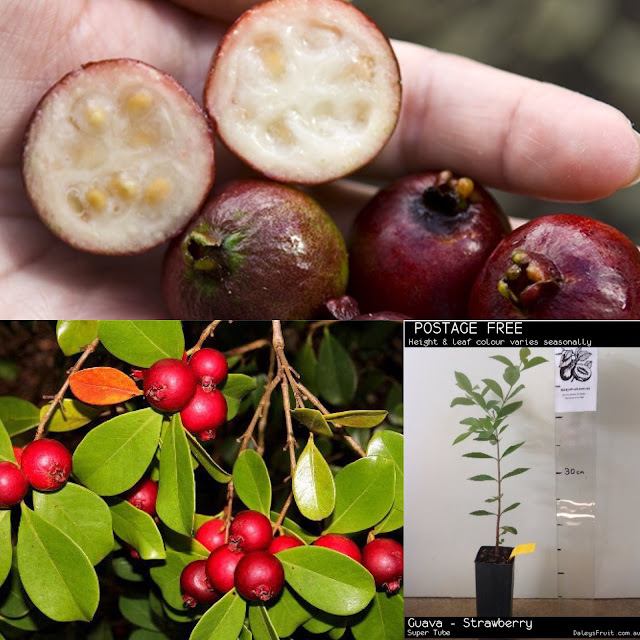 Our strawberry guava fruit tree has golf ball sized red guavas that taste like strawberries or the typical taste that we expect when eating something red. The seeds skin and flesh are all edible. Not the biggest fruit of the guava varieties but you get this one because of the great crop, lovely taste and small size of the shrub in limited spaced backyards. They grow fastest in tropical climates where they can be invasive due to perfect conditions and birds spreading the seeds so best to be responsible and net the fruit from birds and fruit fly. However they are very versatile where they can even handle a frost when grown at altitude or in warm temperate to subtropical climates where they won't be invasive. You can even roast and grind the seeds as a coffee substitute. Notice the shape when you cut open the fruit. 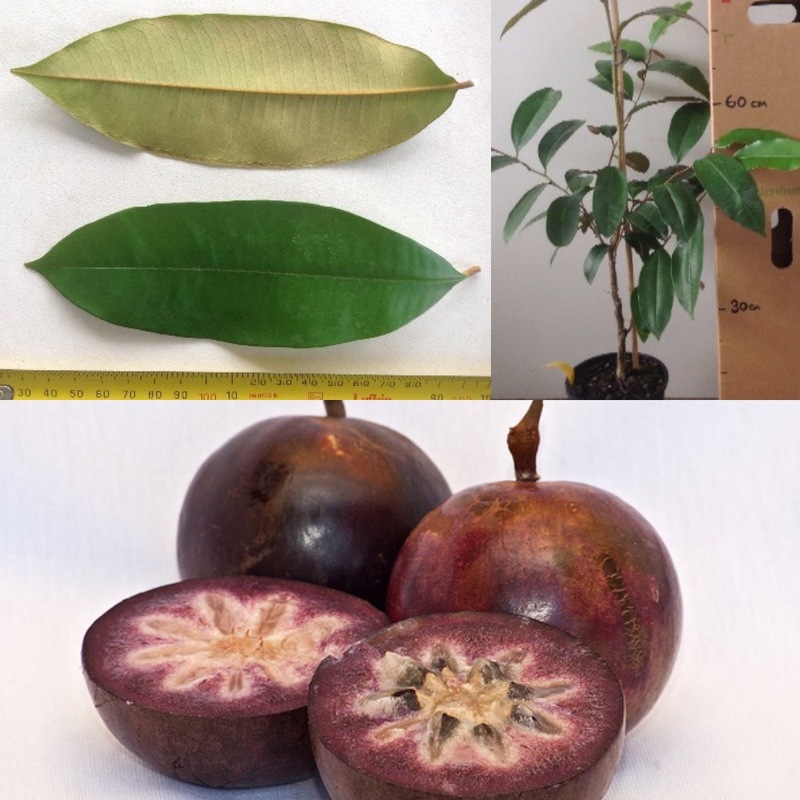 This is a star apple fruit tree and in the right conditions can grow 6-8m and the first thing that people notice from the tree is the large leaves which have a striking contrast between the full green top and browning underneath. A great dense feature tree even without fruit. It doesn't like temperate climates but can grow quite well in subtropical to tropical climates and can be kept quite small in pots. The fruit colour may be purple as in this picture or green.